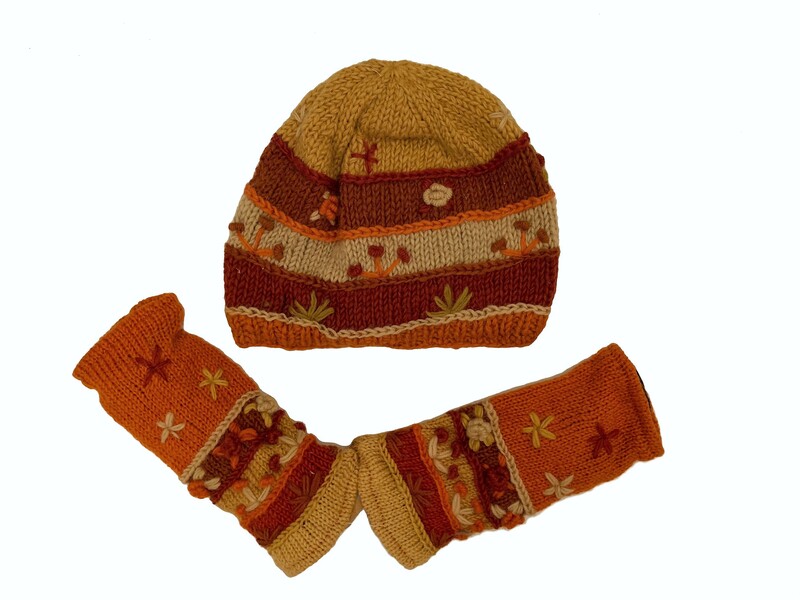 When you need some protection from the cold but don't want to wear a full glove, these lined, hand-knitted wool arm-wrist warmers will do the trick, Yes and you get a matching Hat!!! You will keep that pesky draft from blowing right up your sleeve and still have the freedom to use your electronic devices. Crafted from 100% Woolen Yarn and lined with soft fleece material, these fingerless gloves are perfect for driving or to keep the chill away during a brisk walk.These fingerless mittens come in a variety of colorways and designs and may include embroidered flowers. Each wrist warmer measures about 8-9 inches long by 4 inches wide, when laying flat. These fingerless mittens come in a variety of color ways and designs with various embroidered designs. Hand-crafted from 100% Woolen Yarn with a 100% Polyester Fleece Lining. To care for your new gloves and keep them looking new, hand wash separately in cool water, no bleach, line dry and warm iron, if needed. Due to the handmade nature of these items, each piece will be unique. The Hat is very stretchy and gloves are One size fits most!